I spent a lot of time during my Design Your Destiny 2017 Course coming up with my Word of the Year. This is my 6th year picking a word, and I love it. I’ve found that my word really shapes how my year turns out and guides my focus. My word for 2016 was EASE. I made a lot of important discoveries about how sometimes the most progress happens when we are resting. If you plant a tiny seed in a cup, water it, and put it in the window, you don’t have to dig it up every day to know that something is happening under the soil. But amazing things are happening. That same principle applies in our lives. Toward the end of last year, I started getting restless. I was craving more action, more focused effort, more productivity, so I knew I wanted a more active word for 2017. I chose LEAP because I’m determined to get out of my own way and say yes to things that scare me this year. I have big plans in the works. I’m writing a book, I have a new course coming out, and I’m part of an amazing Life Coach certification program. On top of all that, I’m still doing my own reflection work and discovering more about myself daily. All this while trying to keep up with my busy blended family with ten kids! Just typing it all feels exhausting. And I don’t want to feel that way. I’ve done a pretty good job at implementing my goals this month, but something feels off. This past weekend, I found myself caught up in my thoughts, second guessing my goals, and feeling a lot of anxiety. During my soul writing this morning, I spent quite a while exploring some of these feelings, trying to access some inner wisdom. I came to the conclusion that nothing is wrong with my goals, but I need to let go of the anxious energy behind them. Then in some personal development reading today, I came across this idea of less striving, more relaxing, and more space to allow things to happen naturally. Here I was, right back at my 2016 theme of Ease. It felt like a huge sigh of relief for my soul. Below are some notes I took in my bullet journal, based on what I read today. When I have aha moments, I like to make sure they are in my bullet journal as a reminder. Sometimes when I’m struggling, I’ll read through my journal and the inspiration I’ve recorded there makes a big difference for me. Should I change my Word of the Year? Did I pick the wrong one? Should I go with ease again? The word surrender stood out to me. Maybe 2017 should be the year of surrender. I posted this picture on Instagram and a few friends posted and messaged me with some very insightful comments. One suggested that sometimes by leaping we are surrendering. Perhaps holding on so tightly, and trying to force ease, was really me trying to be in control. I know for sure it was keeping me safe inside my comfort zone. Perhaps leaping is part of the plan for me. Perhaps I need to surrender my will, my desires, and follow God’s plan for me. I try to include Him in my life, but I’m often determined to do things my own way. 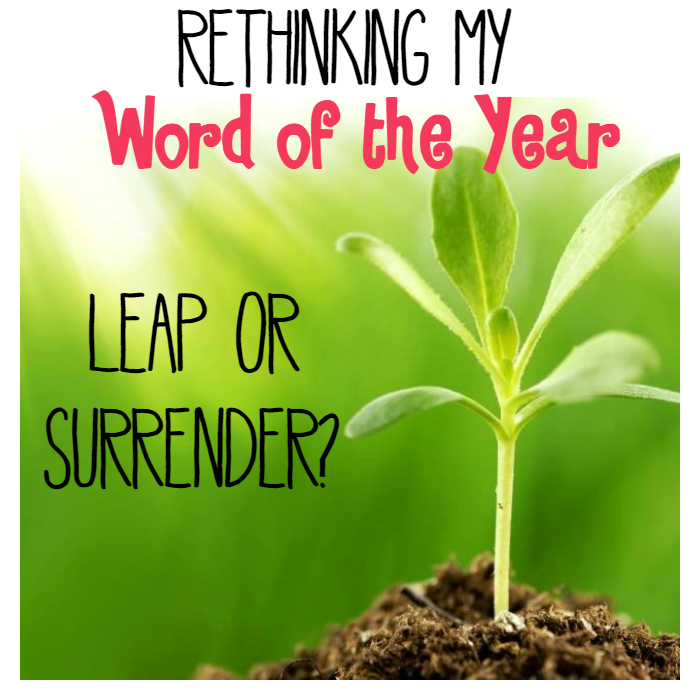 Could surrendering and leaping be two pieces of the same puzzle? I’m still not sure. I’ll have to ponder on it some more, but I might have two words this year. Rebellious, I know! Nothing that has happened to you in your life is an accident. It has all led you purposely to where you are right now. Everything is part of the journey for you to truly discover who you are REALLY meant to be in this life. The further I go down my own path, and the more women I work with, it has become clear that Life creates exactly what we need to take the next step forward. 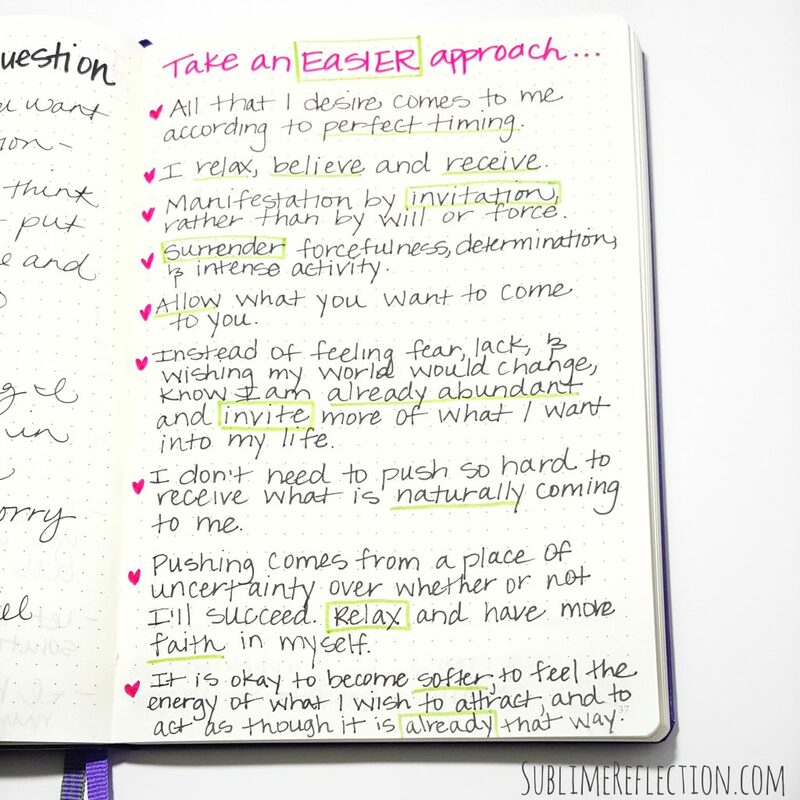 I stumbled upon these ideas exactly when I needed them. If you’re open, and aware, I think you’ll find the same thing happens for you. Messages tend to show up when and where you need them. But you have to be aware and on the lookout to see them. The seeds you are planting right now are being watered and nurtured under the surface even if you don’t see anything but dirt yet. Choose to trust the process. Magic is happening on the inside even if you can’t see it on the outside yet. It’s inspiring as I watch each of you blooming to become the best version of you! « My 2016 Favorite Bullet Journal Pages! No, you did not choose the wrong word. Leap has synonyms and several definitions. Use these during the year as you keep planting the seeds to your own life. They will continue to fit considering what I read above in blog. This message showed up this morning and I REALLY needed it! Thank you Kim! Yay! I love when that happens!